Harper Piver is a dance and multi-media artist who creates things of all sorts: choreography, films, written musings, music, and little balls crafted from empty straw wrappers. Raised as an only child by a band of characters that escaped from an epic Southern novel, Harper discovered that her imagination was more interesting than yet another game of solitaire. Harper’s curiosity propels her journey as an artist. In addition to her initial training as a dancer, her work has included significant encounters with music, text, and video. Her creative impulse stems from a desire to investigate and understand people and the places they inhabit. Her art practice exists where life, art, and media merge, creating an ever-changing landscape of convergences. Until 2005, Harper was based in North Carolina, where her choreography was presented in numerous venues including the American Dance Festival’s Acts to Follow Series and an extended tour with the North Carolina Dance Festival. In addition to dance performance with choreographers in the US and abroad, Harper performed with the John Gamble Dance Theater Company as a dancer and musician. Her choreography has been commissioned and presented by companies and academic institutions around the US. As a video artist, her dance for camera work has been presented in numerous dance film festivals both nationally and internationally. Musically, Harper trained as a classical violinist. She studied Celtic music while living in Edinburgh, Scotland and has since stopped calling her instrument a violin and proudly started calling it a fiddle. She has been fortunate to play on several recordings for Portland-based band Solyoni. Her most recent musical project was The Dark Side of Hall and Oates with Koot Hoomi, a.k.a. husband and collaborator Robert Lurie. Harper’s artistic practice is also influenced by her experiences as an art educator. She currently teaches studio, composition, and lecture classes in dance and film at Arizona State University and in the Maricopa Community Colleges. She also facilitates explorations in dance, video, and the creative process through residency projects in K-12, higher education, and community settings. Her research on dance, technology, and pedagogy has been published and presented worldwide. As an advocate for the arts, Harper co-founded The Dance Cooperative, based in her hometown of Wilmington, NC. Now celebrating almost fourteen years of service, the Cooperative is a community-based 501 (c) 3 not for profit organization offering classes, rehearsal space, and performing opportunities to area professionals, teens, and community members. She also served the dance community as a board member for the North Carolina Dance Alliance, a statewide advocacy organization for dance. Harper has a BFA in Dance from The University of North Carolina at Greensboro and an MFA in Dance from Arizona State University. Upon graduating from ASU, she was named the Outstanding Graduate of the Herberger Institute of Design and the Arts. She is certified to teach both Yoga and Pilates and is a licensed K-12 Dance Educator. Harper currently lives in Tempe, Arizona, where she stays inspired by reading voraciously, traveling often, and singing while commuting. She is slowly working on writing her family back into the novel they abandoned. 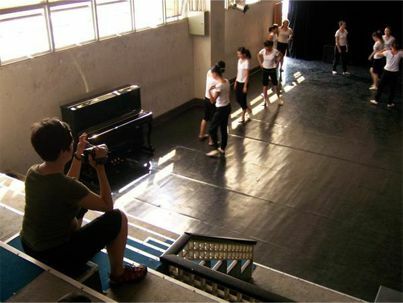 Harper directs H.Lab Performance; a contemporary dance ensemble that performs multi-disciplinary work for stage, site-specific locations, and screen. © 2019 Harper Piver. Web Design and Development by Meghan Bingle.